A character usually has only one master palette, although there are times when the characters are placed in different lighting conditions and require a different colour shading. The night palette is a popular choice when a scene or sequence changes from day to night. It can be difficult and time-consuming to repaint everything and creating two independent palettes can be quite complex. As an alternative, Toon Boom Animate Pro provides clone palettes. 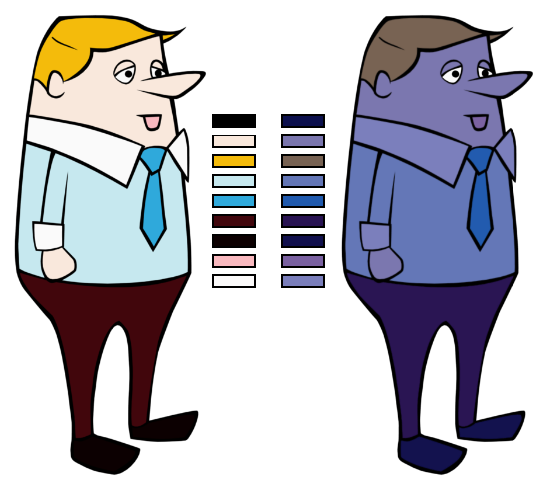 In Toon Boom Animate Pro, you can copy a selected colour swatch and paste it as a clone. 2. In the Colour View menu, select Colours > Copy. The [Ctrl] + [C] (Windows) or [⌘] + [C] (Mac OS X).